Us Made Nylon Paracord, The Real Deal! 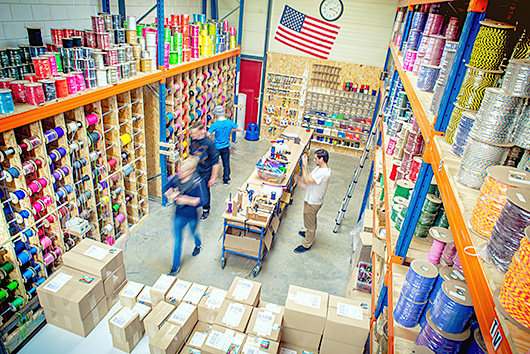 Since 2011, we provide original US Made Nylon Paracord to customers all over Europe. We carry all lengths and types of original us made nylon paracord available over 250 colors/ type combinations. We can supply your business or shop directly from our warehouse. Our working method is focused on flexibility; a maximum of possibilities with a minimal of conditions for you as a customer! We can provide you with complete rolls of 300 meters, but also small Paracord bundles in any color and length. Please contact us to receive a tailor-made offer for your business. Send us an email with your question(s) and company data or please make a phone call to discuss your Paracord wholesale requirements. Widest range of Paracord products in Europe. Only original ‘Us Made’ nylon Paracord!